Those people who need to deal with documents often had to convert documents in one format to other for one reason or the other. Most of the time its either from PDF or to PDF format. It looks like Google is pushing every feature possible into Google Docs. For those of you who have not heard about Google Docs, it is basically Â the online version of office applications just like microsoft word, excel etc. developed by Google. 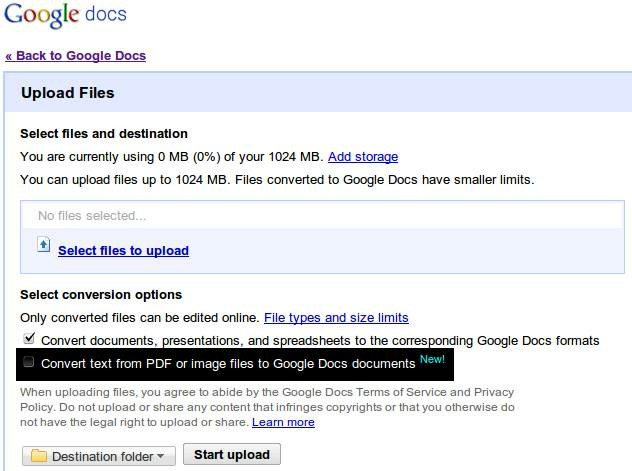 Google has added a new feature called OCR ( Optical Character Recognition) to its Google Docs using which you can convert from PDF or image files to Google Docs documents. You can see this feature being added there if you try to upload a new document. I tried testing it by uploading a PDF document from one of my journal papers I used for my research. The conversion was good except the formatting. They still need to do a lot of work on keeping the format intact but honestly, You cannot expect it to work like a full featured PDF to word convertor. This feature is good enough for most of the people and can convert most of the documents quite well if you can forget the formatting part. Give it a try and share your feedback here in comments on how good it was in converting your document from PDF or Image to text.